Jeannie Faulkner Barber was born and raised in Marshall, Texas. Writing has been one of two passions in her life, the other being drag racing: she met her husband Monte at the track. 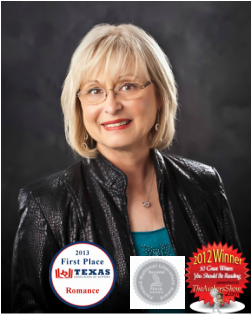 She is an active member of the East Texas Writers Association. She currently lives in Kilgore, Texas with Monte. She has three sons and eight grandchildren. Jeannie Faulkner Barber's Blog: "The Pen Temptress"
Lynn Hobbs is a member of GFWC-Texas Federation of Women’s Clubs – Marshall Women’s Club, American Christian Fiction Writers, East Texas Christian Writers, North East Texas Writers Organization, past treasurer (2011-2012) of East Texas Writers Association, and a Lifetime member of World Wide Who’s Who. Retired from the Texas public school system, Lynn is a native of Houston. Married; two sons, three grandchildren, four cats and one dog complete the family. When she isn’t writing her genre of Christian fiction, her interests include reading, church activities, houseplants, scrap-booking, and quilting. Available for speaking engagements, Lynn has enjoyed speaking at Christian Retreats, Lions Clubs, and other events. World Wide Who’s Who awarded Lynn Hobbs Professional of the Year 2012-2013 in Authorship. The Author Show.com named Lynn as a finalist in their nationwide contest; “Fifty Great Authors You Should Be Reading.” A 2011 winner of National Novel Writers Month (NaNoWriMo), she completed a 50,000 word novel in 30 days. Several of her short stories have placed first and second in contests. Lynn enjoys hearing from her readers, and can be found on Facebook, Goodreads, Twitter, and Amazon.com. Many ask Bernadette Thompson Martin who she is and what makes her tick. To this she responds, "Well, essentially I am no one special, simply a person who has a special gift to share. The ability to pen one's heart and soul, and touch those of another, is a blessed endowment." Until the age of 25, Bernadette lived in Millville, New Jersey, where she graduated from Millville Memorial High School in 1964. Unable to attend college, she was privately tutored by her uncle, a Harvard professor. In 1971 she moved to Miami, where she met and married her husband of 36 years, Ken. IN 2007, they purchased five acres of land in Cottageville, South Carolina, where they currently reside. Bernadette has been compiling ideas for her writing work since the age of nine, collecting them in various containers, until she could start work on them after her retirement from an executive position with a Fortune 500 company in 2008. According to the author, "it is regrettable this career has begun in the autumn of my years, but had I not endured the many wonderful and bizarre experiences of life, this fantasy novel would be unable to attain the level of realism and uniqueness it presents." The son of two 20-year Navy vets, Don A. Martinez spent much of his formative years around the Pacific Rim before settling in the continental U.S., first in Michigan and New York before eventually landing in Texas. Currently, he lives with his wife Stacey and four cats in Texas, where he is a college English instructor. Don A. Martinez's Blog:"The Hidden-In-Plain-Sight Ranch, an Ask blog"
Teresa Richenberger is a true woman of God. She has faced several life-changing challenges and conquered many tribulations through faith in Jesus Christ. Teresa loves God with her whole heart, and she has vowed to live a transparent life, while winning souls to Christ with the "Realness" of her journey and the "Boldness" of her testimony.She inspires others to overcome their fears, doubts and self-defeating habits that hold them back from living God's vision for their lives. She wants to help empower them to succeed in life. Teresa has a heart to see women set free from the things of this world, and to help them see their true worth and value as a woman of God. Teresa is happily married to Wayne Richenberger and he is her best friend. She has two step children and one grand-child. Teresa and her husband live near Longview and serve in the ministry together. The daughter of a WWII Navy vet who survived Pearl Harbor, Patty Wiseman was raised in Washington State. She attended The Wesleyan College in Bartlesville, Oklahoma, and moved to Northeast Texas where she has resided for over 30 years. Writing has been a life-long passion and in 2007, she entered the NaNoWriMo competition to write a novel in 30 days and won. She has several short stories published and is currently working on two other novels while working full time at her job of 23 years at a financial investment company. She has two grown sons and fifteen grandchildren. Patty currently lives with her wonderful husband, Ron, and dog Cutter. Patty Wiseman's Blog: "Patty Wiseman, Writer"
A native Texan, Denny Youngblood currently resides in Longview with his beautiful wife Alice. He earned his Eagle Scout award at age 16, and later went on to serve his country in the U.S. Air Force. His earned Ph.D. in Psychology has helped him to create and pen several novels, short stories, and non-fiction works. In his spare time, he enjoys drawing and painting Western art, and is also an accomplished musician. His wife, children, and grandchildren make his life complete.